Ruth Wheeler, age 93 and a resident of Dallas, passed away peacefully with her family beside her, June 9, 2008. 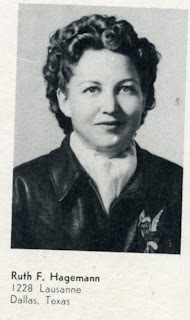 During WWII Ruth was a member of the Women Airforce Service Pilots (WASP). She was also a member of the African Violet Society of America and was the Sunday School Superintendent for Kessler Park United Methodist Church in Dallas for generations of church families. After the war Ruth raised two children and helped start a family real estate business in Dallas. She is survived by her two children, Thomas Wheeler Jr. and Sylvia Wheeler; and leaves behind her sister, Elizabeth Clark Beazley; her two devoted dogs, Sally & Christy; and many nieces, nephews, and loving friends. The funeral service is 2:00 Thursday, June 12 at Kessler Park United Methodist Church in Dallas, Reverend Tim McLemore officiating. Burial will follow Friday, June 13 in El Campo, TX. No visitation will be held prior to the funeral service. In lieu of flowers, memorial donations may be made to Kessler Park UMC or the Dallas Zoological Society, 650 S. R L Thornton, Dallas, TX 75203.